Last month was a watershed moment for my E-Type restoration project. I took the car to the CJC concours event in Little Switzerland. I decided not to enter it to be judged, as there are so many incomplete or missing items that the judges would have needed a supercomputer to add up the deductions! So I entered it in Display. All the positive feedback from the attendees at our event was very gratifying. I also gave a few rides to club members, including a nice fast run down the twisty mountain road leading away from the show site. What fun! Unfortunately, there is not much to report on the restoration front. As some will remember, we got a fair amount of rain the weekend of the show. It is clear that I need to address the water intrusion issues in the cockpit before I proceed with carpet installation or I will just be starting a breeding ground for mold and mildew. So the next action on my “to do list” is to finish sealing the front and rear window openings with silicone as well as sealing all openings in the firewall. I also need to install the splash panels in the engine compartment, which will help keep the electrical circuits dry. Not very glamorous or photogenic work but it needs to be done. I must also confess that my spirited driving at several track events caused heat degradation to my rear brake calipers, to the extent that a few weeks before the concours, I found brake fluid leaking from the one of the rear disc brake calipers. In retrospect, this failure is not a surprise. 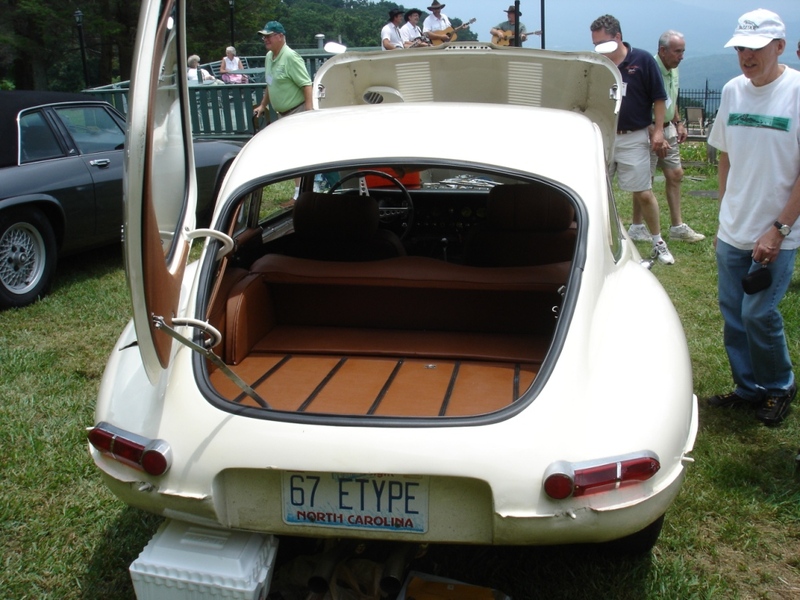 The E-Type has “inboard” brakes at the rear. This is a competition bred arrangement that reduces unsprung weight at the rear wheels. The downside is that the flow of cooling air is reduced at the inboard location where the brakes reside. The Jaguar Competition Manual, developed when these cars were new and running on the track, has drawings for supplemental air cooling ducts that can be added to the car. It looks like installation of these ducts will have to move to the top of my list before I spend more time at the track. One satisfying finding was that I was able to totally remove the IRS from the car, install new disc brake caliper seals, and re-install the IRS in record time. This is one great benefit of having all new and well lubricated parts to deal with. Some of you may recall that it was the dropping of the IRS many years ago to deal with rear brakes that started the years long saga of my restoration. What a fine feeling of accomplishment it was to accomplish this job in 2 days instead of years! I took this opportunity to install EBC “Green Stuff” brake pads in the rear and front calipers, as they come highly recommended. Once I get the water leaks fixed, I will be able to complete carpet installation. I also plan to make a serious assessment of all of my chrome pieces and make some serious decisions about what can be used as is, what needs to be re-chromed, and worst of all, what is just plain missing. I have already found that I am missing the passenger side metal support for the sunvisor so if anyone knows of one of these that I can purchase, please give me a shout. And as always, keep on maintaining, driving, and enjoying these great automobiles!